Posted under Library, Personal on Tuesday, December 1st, 2009 at 11:55 am, by Brian Herzog. Post and comments available via the RSS 2.0 feed. Both comments and pings are currently closed. Great story, I really liked that project too. 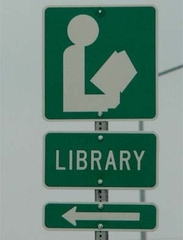 It’s a great way for librarians to connect. Many have a common origin story as well. It’s very valuable to come from another profession, particularly a technical and marketing one. Libraries need a bit more influence from businesses to help them compete. @Jeff: I agree that diverse backgrounds strengthen librarianship as a whole, but I’m always leery of the comparison to the business world. For years I’ve been meaning to write something on why I hate the idea of calling library patrons “customers” but I haven’t gotten around to it. But yes, I really enjoyed reading how other people ended up being librarians – it surprised me how many routes were unique. @Oleg: Thanks – that was also a hat-tip to all the 62+ year old librarians out there still working in the trenches. Good library staff are valuable at any age.